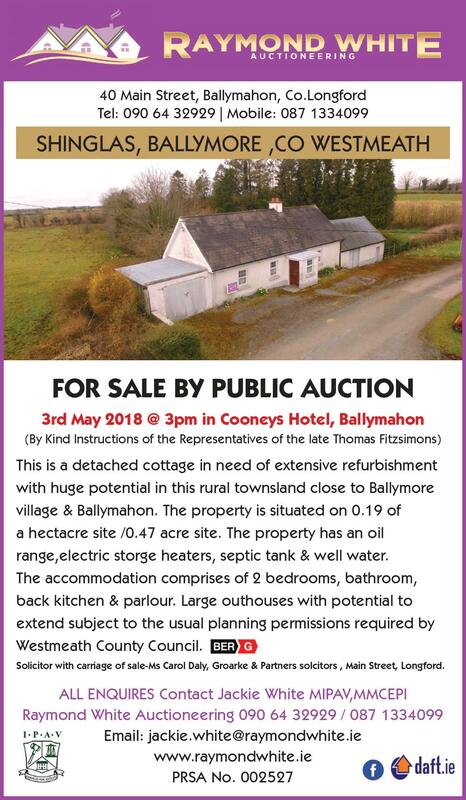 A detached cottage, with huge potential, will go under the hammer at a public auction on Thursday, May 3 at 3pm in Cooney's Hotel, Ballymahon. The property, situated at Shinglas, Ballymore, Co Westmeath, is in need of extensive refurbishment and is situated on 0.19 of a hectare site /0.47 acre site. In a rural setting, close to Ballymore village and Ballymahon, the property has an oil range, electric storage heaters, septic tank & well water. The accommodation comprises of two bedrooms, bathroom, back kitchen & parlour. Large outhouses with potential to extend subject to the usual planning permissions required by Westmeath County Council. The property is coming to auction on the instructions of the representatives of the late Thomas Fitzsimons and Solicitor with carriage of sale is Ms Carol Daly, Groarke & Partners Solicitors, Main Street, Longford.